Before you read on, please make sure that you have seen part 1 which introduces my Online Involute Spur Gear Builder. 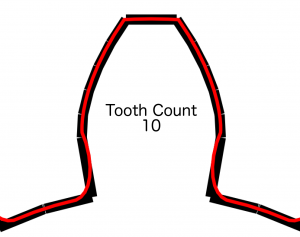 This second part addresses DXF export and compares the generated tooth profiles with the output from a commonly used OpenScad script. Inkscape: Inkscape is a free, open source vector graphics tool that can import the generated dxf output without any issues. Inkscape’s native format is svg but it also supports many other output formats that are useful when dealing with other tools. Lael: Just an update for anyone else trying to use illustrator or having issues importing into drawing programs. I downloaded Dassault draftsight, opened the dxf generated by this generator, then saved it as 2009, 2010 and 2013 dxf. 2009 and 2010 opened fine in illustrator. Jeroen Donker: I found that the dxf output file can be opened in Inkscape (freeware on all platforms) and then saved in any vector format (I use eps) Opening the file in Adobe Illustrator is an easy next step. It is interesting to compare the generated output with that of other tools. In particular this makes it quite easy to see when the undercuts become relevant. For the following I used Leemon Baird’s featured Public Domain Involute Parameterized Gears for OpenScad. Upfront I want to clearly state that this comparison by no means is intended to diminish Leemon Baird’s code. Like many other tools it simply does not cater for undercuts which in most real-world scenarios can be ignored. If undercuts are not an issue Leemon Baird’s tool is a perfect choice. For the comparison I chose a pressure angle of 20°, 8 mm circular pitch, no clearance, and no backlash. For reference here is the scad file with the configuration for the 6 tooth gear and the resulting dxf file generated by Leemon Baird’s script. As expected the two profiles match almost exactly for large tooth counts. 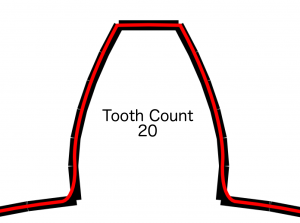 It is interesting to see that even for a tooth count of 20 there is a slight undercut visible. I expect in real live this would not matter since it is compensated for by a non-zero backlash. 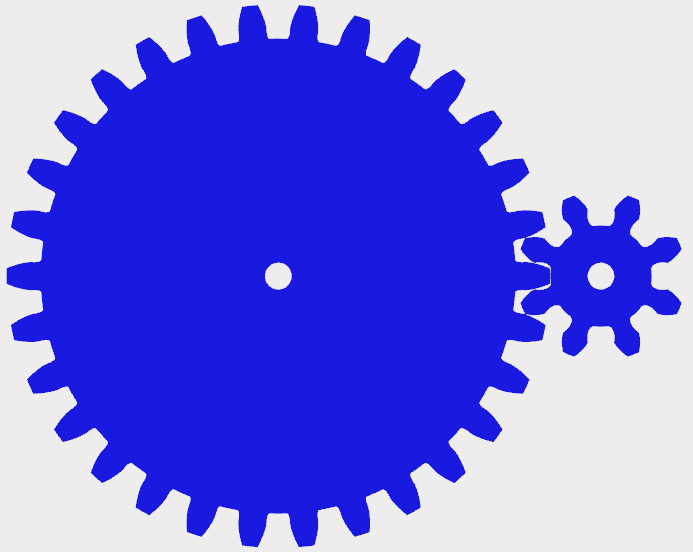 For the impatient: Just head over to the Online Involute Spur Gear Builder page. 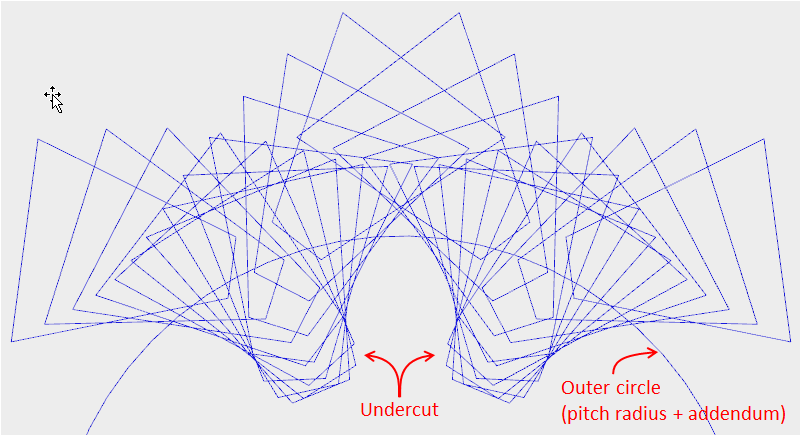 If the undercuts are ignored the resulting gears will jam if machined and assembled precisely. 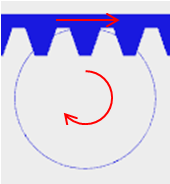 For an elegant description of the issue including a recipe for how to graphically create correct spur gears see Michal Zalewski’s corresponding section in part six of his excellent Guerrilla guide to CNC machining, mold making, and resin casting series. 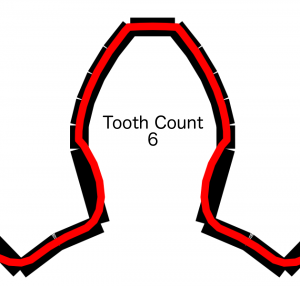 The code behind the online involute spur gear builder determines the tooth profile by simulating how a gear with infinite radius (aka rack) would cut into a smaller gear as discussed by Michal Zalewki. The advantage of the infinite gear is that it has a very simple trapezoidal tooth form solely defined by the addendum height and the pressure angle. In the figure below the rack is shown at the top. When the rack is moved to the right the gear needs to rotate clockwise so that a point on the pitch circle of the gear moves with the same speed as the rack. The code simulates this movement in steps and then for each step subtracts the shape of the rack from the gear. 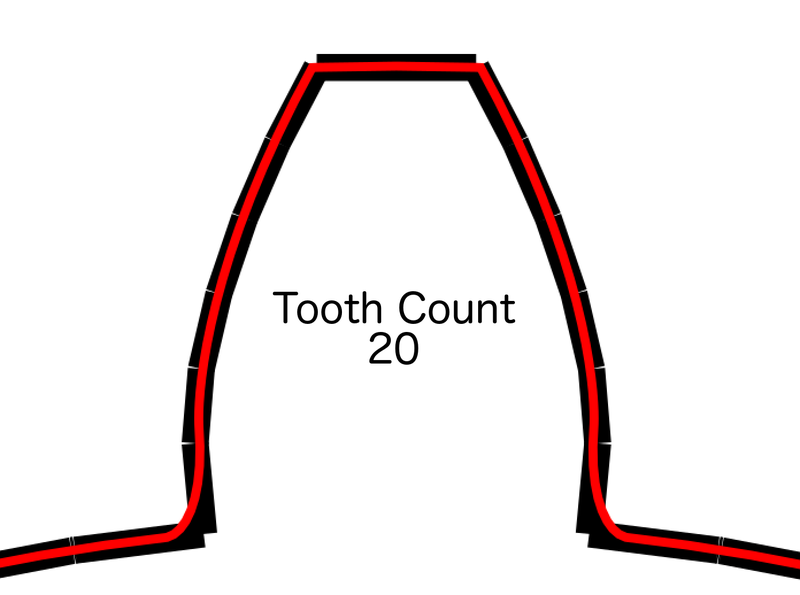 For illustration purposes the figure below has been calculated based on very coarse steps and only shows two teeth of the rack. 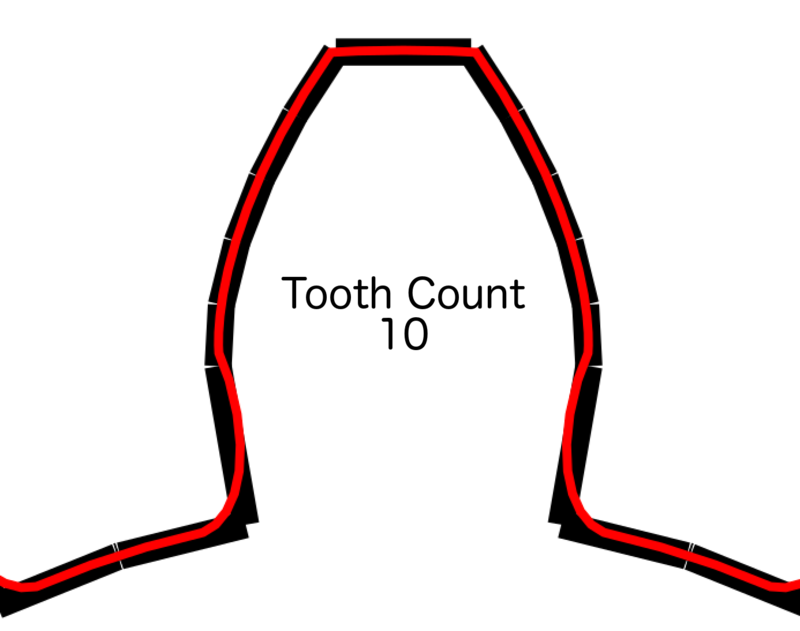 The final result has smooth tooth profiles. 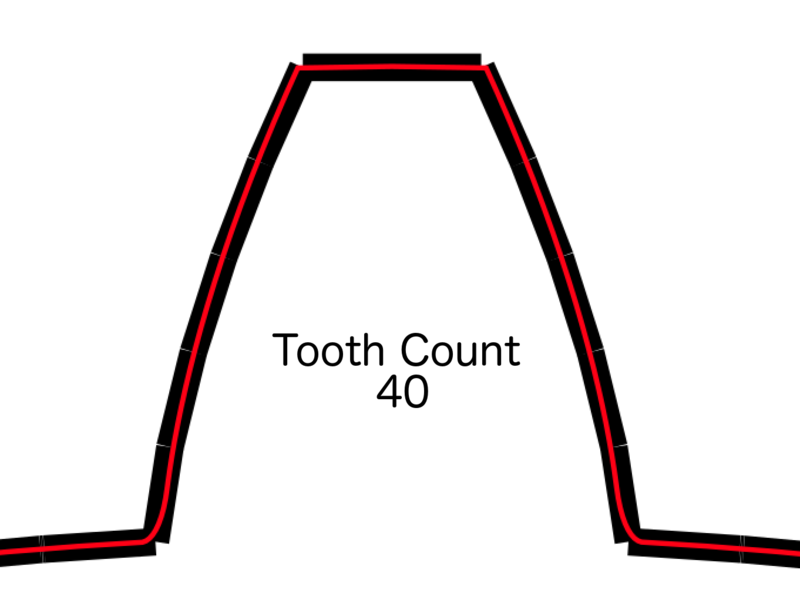 As an example below is an image of a calculated gear set (pressure angle 14.5°) consisting of a 30 tooth gear meshing with an 8 tooth gear. Small values for clearance and backlash were used. 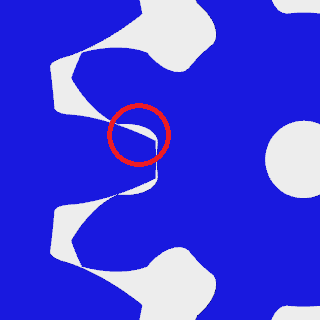 Head over to the involute spur gear builder page to try it out yourself. 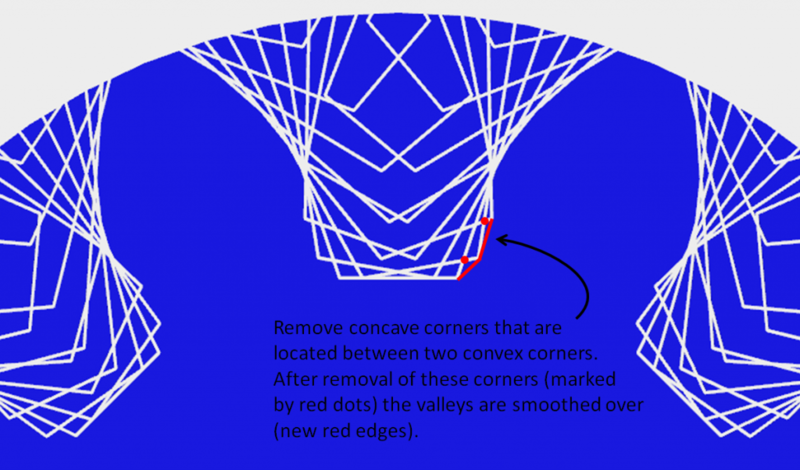 Please see part two for more information about dxf output and how the output compares with that from other tools.